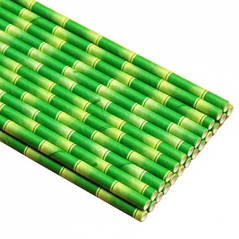 Description:Paper Straw 7.75 Inch Unwrapped Jumbo Straw Bamboo Design -5000ct. Unwrapped 7.75 Inch Jumbo Paper Straw. 6mm Thickness.Strong and Durable Straw. Great for Bars and Restaurants. Compostable and Earth- Friendly. Pack Size is 10-500ct Boxes for a total of 5,000 straws. Join the Movement and be Green at your Next Event or your Restaurant. Perfect Fit with the Wooden Cutlery. We Have Stock. 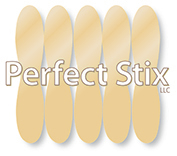 Please call 1-800-341-0079 for Bulk Orders or to Open a Wholesale Account. 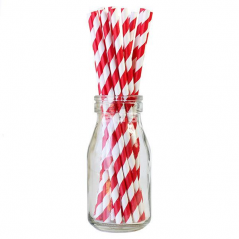 Description:Paper Straw 10.25 Inch Giant Paper Straw Red and White Stripe Unwrapped. Giant Paper Straw. with Thickness of 8mm Thick. Strong and Durable Straw. Great for Bars and Restaurants.Perfect for Milkshakes and Smoothies. Compostable and Earth- Friendly. Pack Size is 300 straws. Join the Movement and be Green at your Next Event or your Restaurant. We Have Stock. Please call 1-800-341-0079 for Custom Print Orders or Bulk orders. Short lead times for Custom Print. Show your customers you care for our Oceans and Promote your Brand. 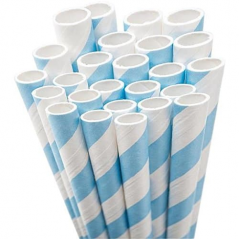 Description:Paper Straw 10.25 Inch Giant Paper Straw Blue and White Stripe Unwrapped. Giant Paper Straw. with Thickness of 8mm Thick. Strong and Durable Straw. Great for Bars and Restaurants.Perfect for Milkshakes and Smoothies. Compostable and Earth- Friendly. Pack Size is 300 straws. Join the Movement and be Green at your Next Event or your Restaurant. We Have Stock. Please call 1-800-341-0079 for Custom Print Orders or Bulk orders. Short lead times for Custom Print. Show your customers you care for our Oceans and Promote your Brand. 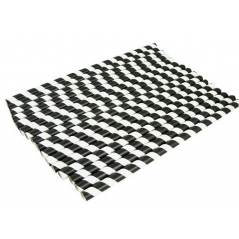 Description:Paper Straw 10.25 Inch Giant Paper Straw Black and White Stripe Unwrapped. Giant Paper Straw. with Thickness of 8mm Thick. Strong and Durable Straw. Great for Bars and Restaurants.Perfect for Milkshakes and Smoothies. Compostable and Earth- Friendly. Pack Size is 300 straws. Join the Movement and be Green at your Next Event or your Restaurant. We Have Stock. Please call 1-800-341-0079 for Custom Print Orders or Bulk orders. Short lead times for Custom Print. Show your customers you care for our Oceans and Promote your Brand. 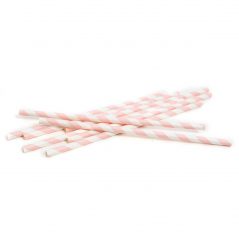 Description:Paper Straw 7.75 Inch Giant Paper Straw Pink Stripe Unwrapped.Thickness of 6mm Thick. Strong and Durable Straw. Great for Bars and Restaurants. Compostable and Earth- Friendly. Pack Size is 300 straws. Join the Movement and be Green at your Next Event or your Restaurant. We Have Stock. Please call 1-800-341-0079 for Custom Print Orders or Bulk orders. Short lead times for Custom Print. Show your customers you care for our Oceans and Promote your Brand.